The response of peripheral T lymphocytes (T cell) is controlled by multiple checkpoints to avoid unwanted activation against self-tissues. Two opposing costimulatory receptors, CD28 and CTLA-4, on T cells bind to the same ligands (CD80 and CD86) on antigen-presenting cells (APCs), and provide positive and negative feedback for T-cell activation, respectively. Early studies suggested that CTLA-4 is induced on activated T cells and binds to CD80/CD86 with much stronger affinity than CD28, providing a competitive inhibition. Subsequent studies by many researchers revealed the more complex mode of T-cell inhibition by CTLA-4. After T-cell activation, CTLA-4 is stored in the intracellular vesicles, and recruited to the immunological synapse formed between T cells and APCs, and inhibits further activation of T cells by blocking signals initiated by T-cell receptors and CD28. CTLA-4-positive cells can also provide cell-extrinsic regulation on other autoreactive T cells, and are considered to provide an essential regulatory mechanism for FoxP3+ regulatory T cells. Genetic deficiency of CTLA-4 leads to CD28-mediated severe autoimmunity in mice and humans, suggesting its function as a fundamental brake that restrains the expansion and activation of self-reactive T cells. 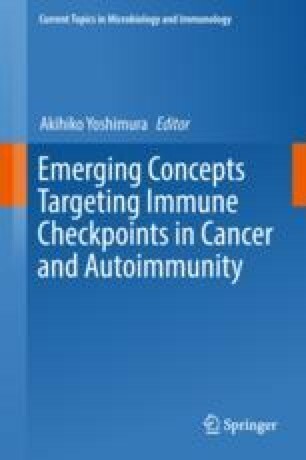 In cancer, therapeutic approaches targeting CTLA-4 by humanized blocking antibodies has been demonstrated to be an effective immunotherapy by reversing T-cell tolerance against tumors. This chapter introduces CTLA-4 biology, including its discovery and mechanism of action, and discusses questions related to CTLA-4. I would like to thank everyone who works/worked on CTLA-4. I especially thank Dr. Jeff Bluestone (University of California, San Francisco) for comments on the manuscript. This work was supported by Kakenhi (17H05801).